In the 2002-2008 period, the quantity of generated waste increased by 55%. In 2008, 42% of waste was deposited, and 58% recovered. Our greatest concern is municipal waste management, as more than 70% of that waste is still deposited. Despite the increased quantity of recovered waste in recent years and the registered decline in deposited quantities, we still remain far behind more developed EU Member States. The indicator shows the quantities of waste generated in Slovenia and the ratio between waste recovered and waste disposed of each year. The quantity and share of each recovery or disposal method are shown for municipal waste, waste from production and service activities and hazardous waste. The purpose of waste recovery is to divert a waste material or its components to beneficial use and particularly comprises reuse and material or biological recovery, and energy recovery of waste using waste as fuel in a combustion plant or industrial furnace, or the use of waste to generate fuel. The recovery procedures are determined in Annex 5 of the Decree on waste management (Official Gazette of the Republic of Slovenia, No. 34/08). Recovery does not include incineration of municipal and other waste by means of thermal treatment for the purpose of disposal. Disposal of waste is the ultimate treatment of waste which cannot be recovered. Disposal methods include biological, thermal or chemo-physical treatment, incineration and landfilling. The procedures of waste disposal are outlined in Annex 6 of the Decree on waste management (Official Gazette of the Republic of Slovenia, No. 34/08). Ministry of the Environment and Spatial Planning (MESP), 2009. • further reduction of the quantities of hazardous waste at a rate of 5 – 10% annually. Economic growth and continuous consumption growth result in extended use of natural resources and increasing quantities of generated waste. Waste management shall in particular focus on prevention of waste production, diminishing of impacts of waste management on the environment and reduction of pressure on natural resources. In spite of the fact that waste management situation in Slovenia still lags behind in achieving the set goals, waste recovery has been steadily gaining ground. One of the reasons is the improved technical feasibility of recovery, allowing for both environmentally friendly and economical treatment. Recovery includes recycling, reuse and thermal treatment, where waste is used as an alternative source of energy. The environmental tax on landfilling serves as encouragement for further exploration of such options. Another reason for increased recovery is related to the use of natural resources. In a consumer society, the useful life of a product is increasingly shorter; often, items are assembled from components which can only be replaced rather than repaired. It is therefore crucial that we maximize the level of reuse, recycling and recovery of waste to avoid excessive exploitation of natural resources. New environmental taxes on packaging, automobile tyres and waste electrical and electronic equipment further encourage the use of recyclable materials. Increasing reuse, recycling and recovery of waste also contribute to the diminishing of greenhouse gases. Though waste recovery is on the rise, absolute quantities of landfilled waste are not diminishing. 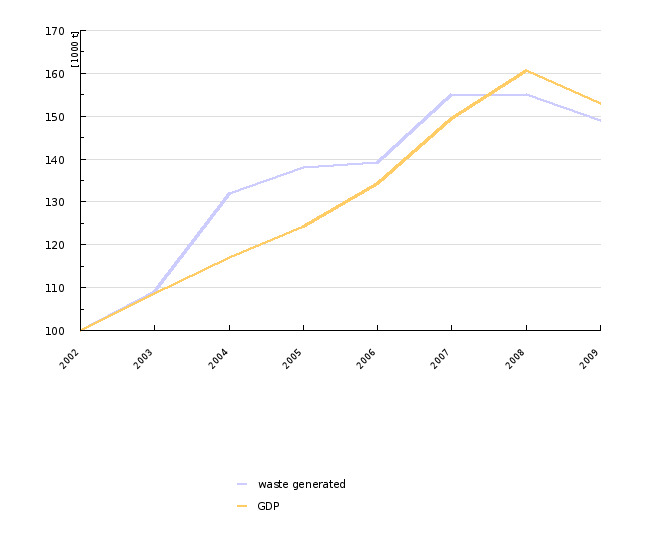 We have not been able to cut the link between GDP growth and the increase of all types of waste (Figure 2). Although the quantity of waste to economic growth ratio did not increase in 2008 in comparison to the preceding year, we have to wait and see in the years to come whether or not we may already speak of decoupling. Furthermore, recovery is currently only suitable for specific types of waste. We will thus be facing quite a few challenges in the future before we shift the ratio between landfilled and recovered waste to the benefit of the latter. In 2008, Slovenia generated about 7 million tonnes of waste. Waste from production and service activities (85 %) accounted for the majority of total generated waste, followed my municipal waste (13%) and hazardous waste (2%). In the 2002-2008 period, the quantity of generated waste increased by 55%. In Slovenia, the management of municipal waste is our greatest concern, since depositing remains to be the most spread mode of waste treatment. In 2008, 71% of the generated municipal waste was deposited on local landfills. The remaining 29% of municipal waste was recovered, most of it recycled (95%). About 65% of waste from production and service activities has been recovered annually since 2002. In 2008, 77 % of waste from production and service activities were recovered, of which again most were recycled (89%). Waste disposed by means of other methods includes fly ash, which is used to backfill mine tunnels, and slag, which is used as construction material. In 2008, 53% of hazardous waste was deposited, mainly on landfills (83%). 47% of hazardous waste was recovered, and here again the share of recycling was the biggest (80%). In total, Slovenia recovered 4.4 million tonnes of waste in 2008, which exceeds the 2002 figures by 74%. In 2008, slightly over 2 million tonnes of waste were deposited, which is by 6% more than in 2002. In 2007, the quantity of deposited waste was by 40% larger than in 2002, but was reduced again in 2008. In total, 42% of waste was deposited and 58% recovered in 2008. Incineration plants provide another opportunity for the disposal of waste. However, they do not allow for advanced waste management due to simultaneous incineration of unprocessed municipal waste, and operate contrary to the European strategy of waste management. For the time being, Slovenia has three facilities for incineration of waste - in Trbovlje, Rače and Deskle. Thermal treatment of waste is also gaining ground in co-incineration of waste. In 2009 only one minor facility for thermal treatment operated in Celje; it is designed as heating plant (with prescribed heating power) which utilises the so-called light fraction of municipal waste as basic fuel. Its main purpose is co-generation of heat and electric power. Plans are prepared for the construction of two further similar facilities, which is considered to be a significant element in our integral concept of waste management. Until recently, waste issues were resolved in a linear manner, which resulted in excessive utilization of natural resources. The mental leap from regarding waste as a substance or item which has to be removed or deposited, to understanding that many useful components of that waste could be returned into production processes (Figure 6), is simple in its essence, but such material flow management requires enormous changed and modifications in the manufacturing of a product, its final use and return of a used or spent product back to the beginning of a production process. Such manner of waste management requires great adaptability of the industry, willing to produce products containing less hazardous substances and as many recyclable materials as possible, and great environmental awareness of users – consumers on the other hand, who should give purchase preference to such products regardless of their price, and environmental awareness of final users generating waste from such products, but provide for their proper treatment. In this way, we can save not only our natural resources, but also energy required in the extraction or acquisition of new raw materials, their shipments, processing and preparing for production. Although the quantity of recovered of waste is increasing in recent years and only minor quantities are still deposited, our waste management is lagging behind better developed EU Member States. The long-term objective of the Thematic Strategy on the prevention and recycling of waste is namely to help Europe become a recycling society that seeks to avoid waste and uses waste as a resource. In addition to the already implemented waste management plans, a programme for waste prevention will have to be prepared in order to achieve this long-term objective with the guiding principle of waste management hierarchy which give priority to waste prevention and ranks depositing on landfills as the very last and least desired possibility in waste management. The new Waste Framework Directive 2008/98/EC sets the basic concepts of waste management at the EU level and at the same time allows Member States to specify in detail their national measures and procedures to achieve the objectives. New environmental goals will have to be defined, encouraging separation, reuse and recycling, the waste catalogue will be modified, and new guidelines for waste management adopted. Slovenia has to transpose the provisions of the new directive in its legal order within two years of its adoption, so that amendments to the currently applicable Decree on waste management (Official Gazette of the Republic of Slovenia, No. 34/08) can be expected by the end of 2010. Objectives summarized by: Resolution on National Environmental Action Plan 2005-2012 (Official Gazette of the Republic of Slovenia, No. 2/06). Source database or source: Waste Management Database, Environmental Agency of the Republic of Slovenia and Statistical Office of the Republic of Slovenia. Methodology and frequency of data collection for the indicator: Data have been captured for the 2002-2008, they are collected annually. Environmental Agency of the Republic of Slovenia, gathers data on waste generation and management for all types of waste in the Republic of Slovenia. The required reporting on waste is prescribed on the basis of Environment Protection Act (Official Gazette of the Republic of Slovenia, Nos. 41/04, 20/06 and 70/08), and detailed in the Decree on waste management (Official Gazette of the Republic of Slovenia, No. 34/08), and up to 2008, in the Rules on waste management (Official Gazette of the Republic of Slovenia, Nos. 84/98, 45/00, 20/01, 13/03). Provisions on municipal waste are given in the Order on the management of separately collected fractions in the public service of urban waste management (Official Gazette of the Republic of Slovenia, Nos. 21/01 and 41/04). Municipal waste must be reported by local providers of public service of collection and transport of municipal and similar waste generated by production and service sectors and public municipal services. The Rules on waste management stipulate that reports on waste from production and service activities must be submitted by generators, collectors, recovery providers or disposers of non-hazardous and hazardous waste from production and service activities exceeding the prescribed quantity threshold (10 tonnes for non-hazardous waste and 5 tonnes for hazardous waste). Reports are submitted by March 31 for the previous year. Up to 2007, hazardous waste was reported both within the framework of municipal waste and waste from production and service facilities, and separately, yet after 2007 hazardous waste is only recorded separately. Quantities of collected municipal waste and of from production and service facilities for 2007 and 2008, thus, only cover collected quantities non-of hazardous waste. In 2008, the Environmental Agency of the Republic of Slovenia and Statistical Office of the Republic of Slovenia harmonised their methodology for gathering and processing of data on collected quantities of waste, so that since that year the data is reconciled and there will be no separate reporting in the future. 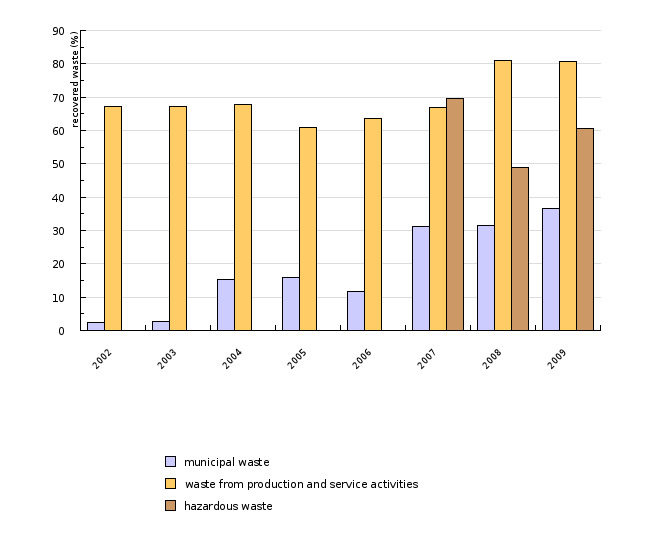 The graph in Figure OD7-1 shows data on total quantity of generated waste (in 000 tonnes), calculated by summing up the data for municipal waste,waste from production and service activities and hazardous waste in each year. In Figure OD7-2: Total quantity of waste generated in Slovenia in comparison to GDP, data were converted to the index of base year 2002. 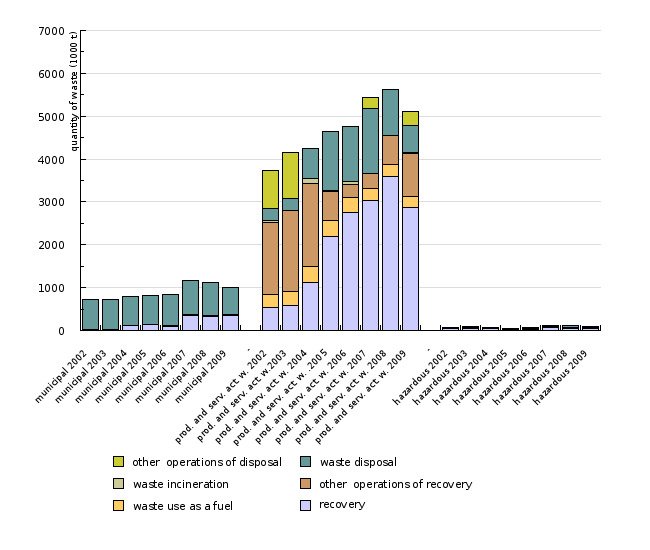 Data on the quantities of recovered and deposited waste (in 000 tonnes) by mode of treatment (recycling, incineration, depositing, …) are presented in Figure OD7-3. 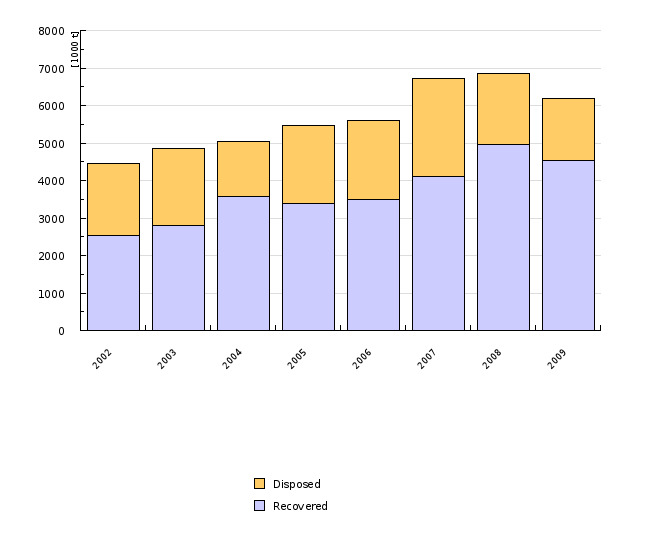 Figure OD7-4 shows calculated data of recovered municipal waste, waste from production and service activities and hazardous waste compared to the 2008 target. Up to 2007, hazardous waste is presented as part of waste from production and service activities and of municipal waste, but due to methodology change in 2007, hazardous waste for the years 2007 and 2008 are presented separately and are no longer part of municipal or waste from production and service activities. 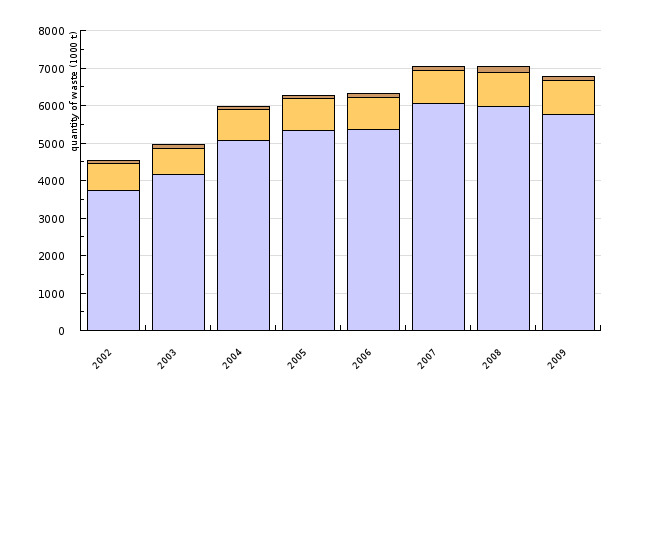 Total quantities of recovered and deposited waste (in 000 tonnes) for the 2002-2008 period in Slovenia are shown in Figure OD7-5. Figure OD7-6 is adjusted according to the waste management hierarchy. - Advantages and disadvantages of the indicator: After 2002, the methodology of waste data collection was harmonised between the competent Slovene authorities (EARS, SORS), and since 2008 it has also been brought in accord with the methodology for reporting to institutions under international reporting obligation. Reliability of the indicator (archival data): Data are reliable. - MESP, 2009. Novosti na področju ravnanja z odpadki. 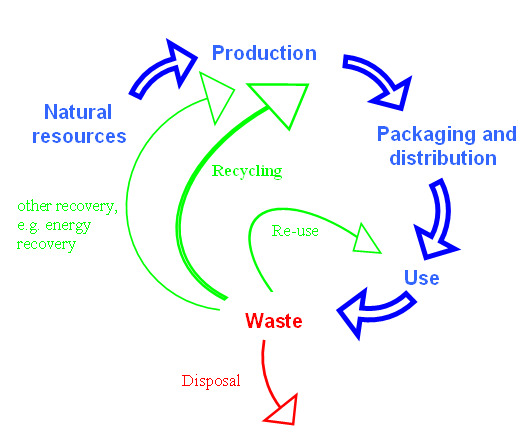 - Thematic Strategy in the prevention and recycling of waste, 2005.